Above: Oonagh Carney, Bronwyn Thompson, Francesca Caputi and Elio Capolupo. 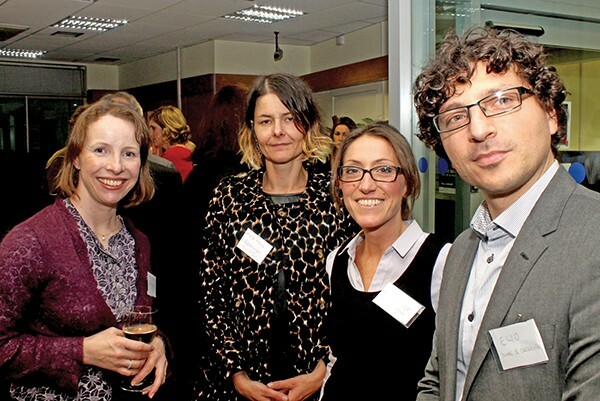 Hats off to the management and staff of the AIB in Sandymount who hosted a business networking evening on November 11th. NewsFour mingled to eavesdrop on some conversations and found people with professions from tax consultants to restaurateurs and shopkeepers, with the overwhelming theme being getting to know each other a bit better. We spoke to one motivated entrepreneur who is carving himself a niche as a quality professional handyman. Paul Saul has lived and worked in the area on and off for the last 30 years. He started his career in the Oscar Theatre building sets before doing stints in the Gate and Abbey. Since then he has travelled the world and has done pretty much everything from electronic engineering to painting. He has spent the last two years building a loyal client list in the area with his business, Lovely Handyman. He told us that he gets lots of work because he’ll do anything. “I don’t mind if it’s plumbing, electrical or carpentry; the most important thing to me is doing the job well.” As for what he hoped to get out of the evening, he told us that for him and most of the people there it was more about being part of a community than making deals.